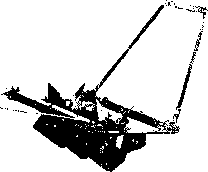 This is a simple weeder equipped with two spiked wheels rotating in a supporting frame, the front of which forms a skid. 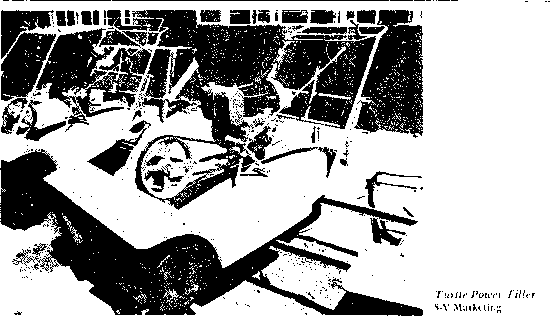 The two rotors and skid are made from light sheet metal and are easily dismantled for cleaning and repair. The handle is made of wood. 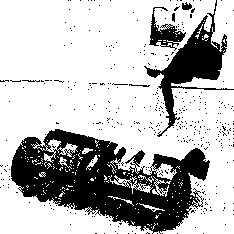 The leading skid serves as a depth control for the wheels. Build-it plans are available from 1RR1 for this -imply constructed implement. This is a lightweight, all-steel weeder. It is best used on fields where 25 to 50 millimeters (1 to 2 inches) of water is standing. The rotary blades remove weeds and aerate the soil, thus encouraging crop growth. Weight: 5 kilograms. 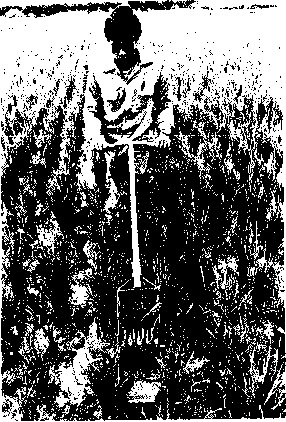 Cultivation by this implement between the tows of plants kills weeds and aerates the roots of the crop. It has a front skid and a tubular steel handle which is adjustable for different operators and soil conditions, it is available in two models, the AX-53, 150 millimeters wide and weighing 3.3 kilograms, and the AK-55, 90 millimeters wide and weighing 3.0 kilograms. The CeCoCo weeder is U-shaped with a float and two claw wheels, and it has a wooden handle which can be adjusted to Miit the height of the operator. It has a widtli of 150 millimeters to suit row spacing of 210 to 230 millimeters. Weight: 5 kilograms. 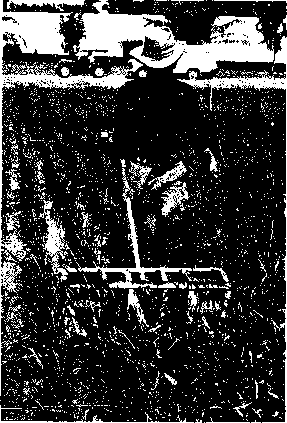 Labeled photographs illustrate how a rotary weeder for row-planted rice can be locally built. Covering 3 to 4 acres per day, the Puddler is designed for quick and efficient preparation of paddy fields after first plowing. It reduces the number of plowing» necessary and breaks up clods and lumps. The three angular, cast-iron hubs with four blades on each hub churn up the soil and leave fine particles on the soil surface. Cosiul Bullock-Driven Wetland Puddler Cossul & Co.
* All Intermediate Technology publications can be ordered from International Scholarly Book Services, Inc., Box 555, Forest Grove, OR 97H6. The rotary hoc is designed lor weeding crops grown on paddy ridges at lb to 90 centimeters spacing. It cultivates both sides of one ridge at a time and does not require straight and parallel ridges for efficient weeding. 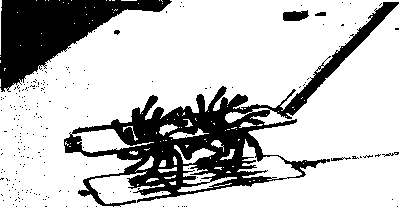 Cultivation is done by two gangs of four spider wheels, each having ten backward-curved tines. The rotary hoe can be used for weeding closer to the crop than sweep cultivators without causing apparent crop damage. Performance is good if weeding is carried out while the weeds are small, an<' the implement is designed to tide over stumps or other obstructions in improperly cleared land. Illustrations for a multiaction paddy field puddling tool with Japanese design reveal a wooden frame. The 8-inch steel rotating discs, cutting knives, and rotating chopper blades are suitably designed for iocai construction. This three-row power weeder was designed by die International Rice Research Institute for use in lowland areas of developing countries. Many local manufacturers have adopted their design. Build-it plans are available £rom IRRI. The MRT-3 is a three-row tiller with safety guards. The MRT-D is a cultivator which combines tilling and trenching work. It will till three rows at one time or trench one row in a "V" shape so that roots are not damaged. Both are lightweight, have adjustable handles, and are easy to maneuver. Tilling supplies oxygen and expels nitrogen gas which has generated from straw scattered in the paddies after harvest. The nitrogen must be expelled to prevent root rot and other damage. 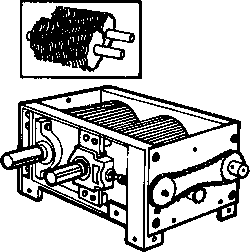 A two-cycle, air-cooled, 2.2 h.p. gasoline engine is mounted on the handles where it balances the construction and places weight on the cultivating attachments. Model MRT-3 has a capacity for covering about an '¡ci e per hour while the MRT-D will cover the same area in 30 to 40 minutes. What is wetland puddler made of which metal? Where can i get a rotary hoe mechanical push weeder for paddy in gujarat?